A new series from Speakeasy Comics, by creator Brian Augustyn (Flash, Out There) and artist Dub! All over the world theres a startling outbreak of super-powers among previously normal human beings. This bizarre wave of incredible change evokes terror in some, suspicion, and cynical calculation in others. Only one man saw it coming, and hes been waiting for it for 1400 years! 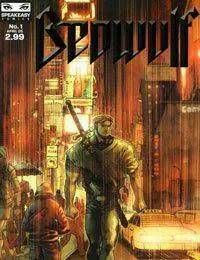 Once called Beowulf, now the great warrior lives in Manhattan and goes by the simpler name of Wulf. He alone knows that a coming world- threat has triggered the sudden power influx, but not even Wulf is in the dark as to what horrific shape that threat will take. In any case he makes his plans, bides his eternal time and waits for trouble to start. Perhaps the new hero of Times Square, known only as Powerhouse, will be an ally in the coming cataclysm ? if he and Wulf manage to survive the citys fear and loathing of the new powerful beings.